Cattleyas have earned the reputation as the "Queen of Orchids" and are known to the public as the ultimate in floral corsages. While some naturally occurring species are offered by growers, the most popular plants are man-made hybrids, such as this Brassolaeliocattleya (BRASSAVOLA X LALELIA X CATTLEYA, "Dennise Kone"). Delicately poise, this orchid will make a wonderful gift or the perfect addition to your orchid collection. 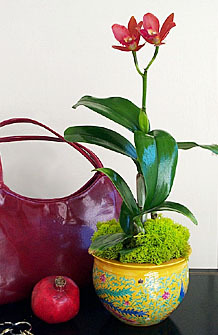 Accentuate the beauty of your potted Cattleya with this porcelain cachepot as shown in the picture. For details on cachepot, click here. Plants are shipped in combination of buds and full bloom as you see in the pictures. From base line to top petals, the orchid stands at approximately 12-15 inches tall. The blooms (3-5 buds) measure 4 inches in diameter.